It is very difficult for a traveler to go on a honeymoonJ; to follow a path that some tour agent has planned for you; to stop the temptation of exploring the place and to keep the hands off the camera; and expect all this in Sikkim? In spite of all those, the traveler in me took over to experience the beauty of North eastern tip of India. I had planned the entire trip few months ago, through a tour agent in Silliguri by name “Nature Beyond”. My married friends had advised me that, when you go on a trip such as this, everything should be arranged because it’s a time to enjoy each other’s company and not break your head on which hotel to book? Which places to see? And what mode of transportation and they were right. Though not my type of travels, I enjoyed the once in a while luxury of relaxing throughout the trip. When P gave me the freedom to choose the destination, I was obviously happy to use this opportunity to explore a new place. Sikkim was always in my mind and I reconfirmed it after talking to couple of people who has been there before. One of my friends had been there too after his wedding and I got the details of the tour plans. Lakshmi, Celina & Mridula helped me with information about places I could see while I am there. Finally I presented a customized tour plan based on these tips, to the agents and asked them for a quote. After that not so nice experience at Kolkata, we reached Bagdogra airport at around 4:30 PM. Mahesh, one of the planner from “Nature beyond” received us at the airport. We quickly drew out of airport, towards Sikkim. Bagdogra is at the northern tip of West Bengal and is the nearest airport to Sikkim (4 hours drive from Gangtok). On our way, Mahesh briefed us about the tour plan. I was a little curious to know more about the place and Mahesh was the best person to furnish us those details. Siliguri is a nice city. There are few good universities and colleges. The weather is very pleasant. Mahesh got off before we crossed the city borders and we drove ahead to Pelling, which is 5 hours drive from Siliguri. Our driver was nice enough to guide us through the journey and showed us the army training area, new dams being constructed etc. It was one of the most beautiful drives I have been in. The sky turned grey and then dark almost as soon as we drew out of Silliguri and as my eyes adjusted to the darkness outside, it could not stop admiring the beautiful outline of the mountains, voices from the Theestha River flowing adjacent the road and an almost full size moon showing us the way ahead. Buses Ply from Silliguri to Gangtok and the fair is Rs140. On the way we stopped at Unthees mile to have tea. A Bihari lady at the shop asked me to try Veg momo’s; made of steamed Miada, stuffed with vegetables. It tasted good. 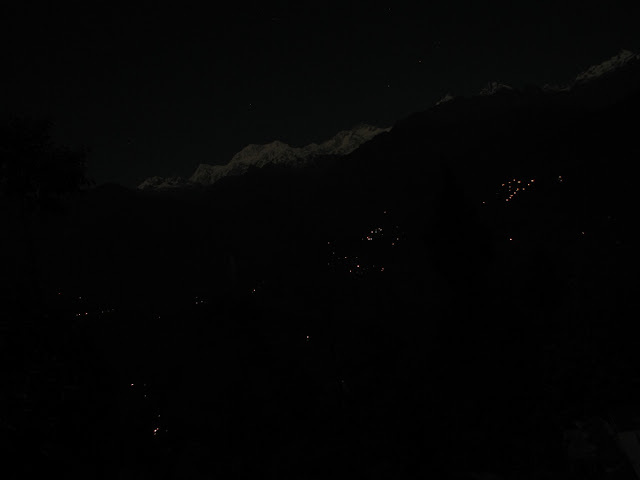 We reached resort Pachu resort at Pelling at about 10:30PM. 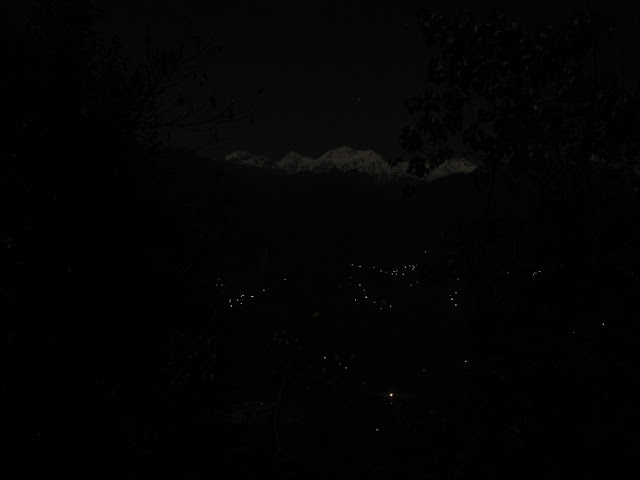 While nearing the resort, we had the first view of Kanch-Chen-Dzonga; with its snow headed crown, still bright enough to be seen in the middle of the night. We were mesmerized by the view. At the resort we were welcomed by the proprietor Mr.Tshering Bhutia by honoring us with a white silk shawl which is called Khatag; Tibetan way of showing respect and wishing good. A cup of brandy was offered as welcome drink, which we politely declined. The cook had prepared good food for us and he proudly told us that all the vegetables used is grown at the resort. It is great to see people growing their own veggies. It is a very green way of living. The white shawl is probably 'katak', Tibetan Buddhist way of wishing good. that is a wonderful experience to explore Sikkim, isn't it? I can very well relate those places, they are so different and beautiful. @Arun - True. Thanks for that bit of info, i will update the post with this detail. Welcome to my blog. @Alok- - Yes, the place is superb. Have you been there? nice post on sikkim! just a few days ago i was in Mangan music festival and it was rocking. I visited namchi as well where i was able to see the gigantic samdruptse and under construction char dham... it was kinda spiritual tour. That's cool! I was at Silliguri about 2 weeks back but I was coming back from Bhutan. Looking forward to more! nice well illustrated post.. Now i m tempted to go down there!!! Unfortunate experience you've had at the Temple in Kolkata but a great place you chose for your honeymoon. Delighted to help in little ways and more so that you had a good time. Beautiful and serene Sikkim is a place I'd love to go to again and again, and I guess you feel the same since returning. How did P like it?